So far the application has been running locally in IIS Express on your development computer. To make a real application available for other people to use over the Internet, you have to deploy it to a web hosting provider, and you have to deploy the database to a database server. In this tutorial you'll learn how to use connection resiliency and command interception. They are two important features of Entity Framework 6 that are especially valuable when you are deploying to the cloud environment: connection resiliency (automatic retries for transient errors) and command interception (catch all SQL queries sent to the database in order to log or change them). This connection resiliency and command interception tutorial is optional. If you skip this tutorial, a few minor adjustments will have to be made in subsequent tutorials. When you deploy the application to Windows Azure, you'll deploy the database to Windows Azure SQL Database, a cloud database service. Transient connection errors are typically more frequent when you connect to a cloud database service than when your web server and your database server are directly connected together in the same data center. Even if a cloud web server and a cloud database service are hosted in the same data center, there are more network connections between them that can have problems, such as load balancers. Many or most connection problems when you're accessing a cloud service are transient, that is, they resolve themselves in a short period of time. So when you try a database operation and get a type of error that is typically transient, you could try the operation again after a short wait, and the operation might be successful. You can provide a much better experience for your users if you handle transient errors by automatically trying again, making most of them invisible to the customer. 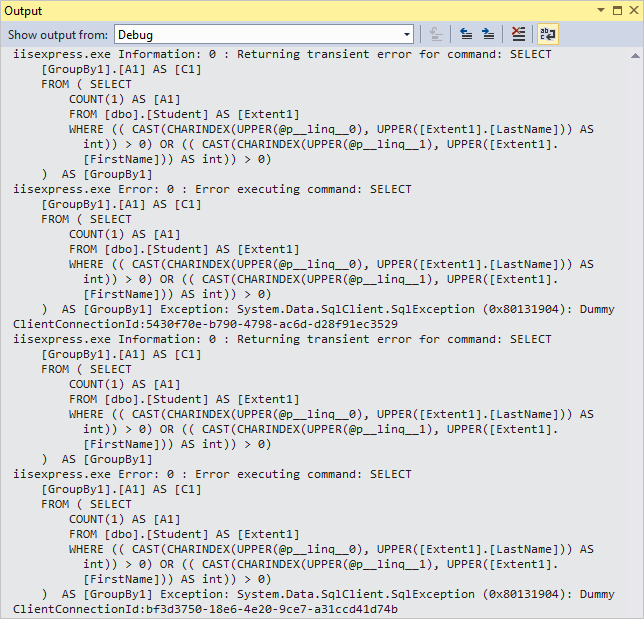 The connection resiliency feature in Entity Framework 6 automates that process of retrying failed SQL queries. 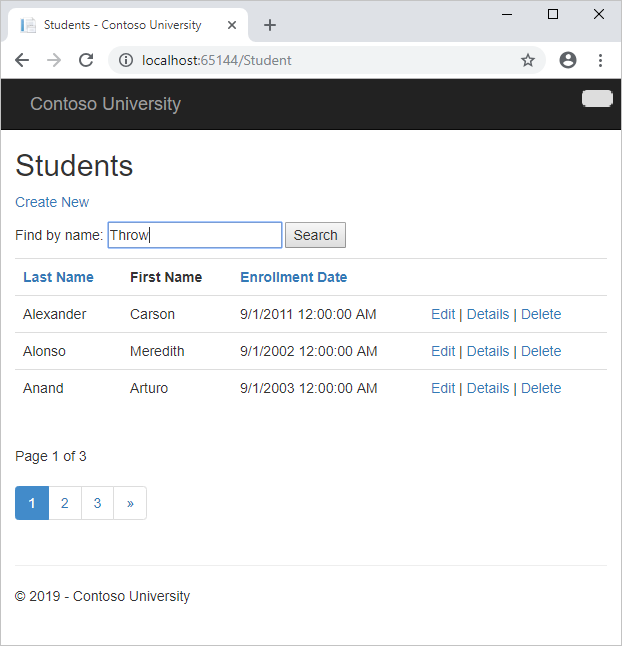 You can configure these settings manually for any database environment supported by an Entity Framework provider, but default values that typically work well for an online application that uses Windows Azure SQL Database have already been configured for you, and those are the settings you'll implement for the Contoso University application. All you have to do to enable connection resiliency is create a class in your assembly that derives from the DbConfiguration class, and in that class set the SQL Database execution strategy, which in EF is another term for retry policy. In the DAL folder, add a class file named SchoolConfiguration.cs. 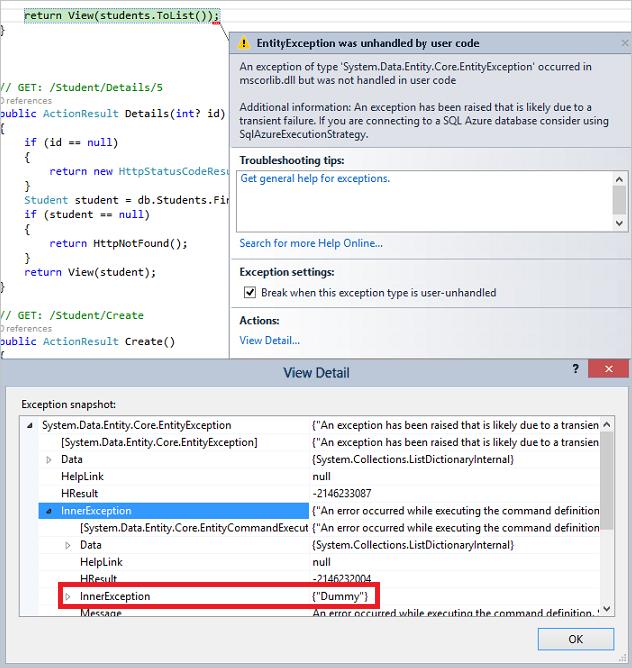 In StudentController.cs, add a using statement for System.Data.Entity.Infrastructure. You were using DataException to try to identify errors that might be transient in order to give a friendly "try again" message. But now that you've turned on a retry policy, the only errors likely to be transient will already have been tried and failed several times and the actual exception returned will be wrapped in the RetryLimitExceededException exception. For more information, see Entity Framework Connection Resiliency / Retry Logic. Now that you've turned on a retry policy, how do you test to verify that it is working as expected? It's not so easy to force a transient error to happen, especially when you're running locally, and it would be especially difficult to integrate actual transient errors into an automated unit test. To test the connection resiliency feature, you need a way to intercept queries that Entity Framework sends to SQL Server and replace the SQL Server response with an exception type that is typically transient. You can also use query interception in order to implement a best practice for cloud applications: log the latency and success or failure of all calls to external services such as database services. EF6 provides a dedicated logging API that can make it easier to do logging, but in this section of the tutorial you'll learn how to use the Entity Framework's interception feature directly, both for logging and for simulating transient errors. Create a folder in the project and name it Logging. The implementation uses System.Diagnostics to do the tracing. This is a built-in feature of .NET which makes it easy to generate and use tracing information. There are many "listeners" you can use with System.Diagnostics tracing, to write logs to files, for example, or to write them to blob storage in Azure. See some of the options, and links to other resources for more information, in Troubleshooting Azure Web Sites in Visual Studio. For this tutorial you'll only look at logs in the Visual Studio Output window. In a production application you might want to consider tracing packages other than System.Diagnostics, and the ILogger interface makes it relatively easy to switch to a different tracing mechanism if you decide to do that. Next you'll create the classes that the Entity Framework will call into every time it is going to send a query to the database, one to simulate transient errors and one to do logging. These interceptor classes must derive from the DbCommandInterceptor class. In them you write method overrides that are automatically called when query is about to be executed. In these methods you can examine or log the query that is being sent to the database, and you can change the query before it's sent to the database or return something to Entity Framework yourself without even passing the query to the database. This code only overrides the ReaderExecuting method, which is called for queries that can return multiple rows of data. If you wanted to check connection resiliency for other types of queries, you could also override the NonQueryExecuting and ScalarExecuting methods, as the logging interceptor does. When you run the Student page and enter "Throw" as the search string, this code creates a dummy SQL Database exception for error number 20, a type known to be typically transient. Other error numbers currently recognized as transient are 64, 233, 10053, 10054, 10060, 10928, 10929, 40197, 40501, and 40613, but these are subject to change in new versions of SQL Database. The code returns the exception to Entity Framework instead of running the query and passing back query results. The transient exception is returned four times, and then the code reverts to the normal procedure of passing the query to the database. Because everything is logged, you'll be able to see that Entity Framework tries to execute the query four times before finally succeeding, and the only difference in the application is that it takes longer to render a page with query results. The number of times the Entity Framework will retry is configurable; the code specifies four times because that's the default value for the SQL Database execution policy. If you change the execution policy, you'd also change the code here that specifies how many times transient errors are generated. You could also change the code to generate more exceptions so that Entity Framework will throw the RetryLimitExceededException exception. The value you enter in the Search box will be in command.Parameters and command.Parameters (one is used for the first name and one for the last name). When the value "%Throw%" is found, "Throw" is replaced in those parameters by "an" so that some students will be found and returned. This is just a convenient way to test connection resiliency based on changing some input to the application UI. You can also write code that generates transient errors for all queries or updates, as explained later in the comments about the DbInterception.Add method. You can add interceptors using the DbInterception.Add method anywhere in your code; it doesn't have to be in the Application_Start method. Another option is to put this code in the DbConfiguration class that you created earlier to configure the execution policy. Wherever you put this code, be careful not to execute DbInterception.Add for the same interceptor more than once, or you'll get additional interceptor instances. 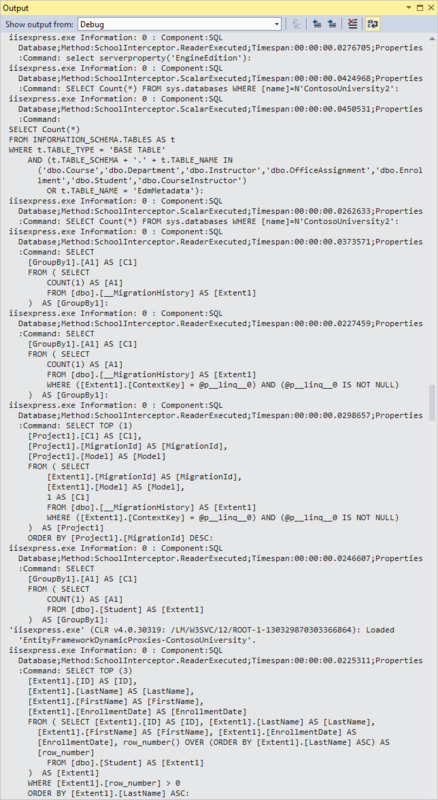 For example, if you add the logging interceptor twice, you'll see two logs for every SQL query. Interceptors are executed in the order of registration (the order in which the DbInterception.Add method is called). The order might matter depending on what you're doing in the interceptor. For example, an interceptor might change the SQL command that it gets in the CommandText property. If it does change the SQL command, the next interceptor will get the changed SQL command, not the original SQL command. You've written the transient error simulation code in a way that lets you cause transient errors by entering a different value in the UI. As an alternative, you could write the interceptor code to always generate the sequence of transient exceptions without checking for a particular parameter value. You could then add the interceptor only when you want to generate transient errors. If you do this, however, don't add the interceptor until after database initialization has completed. In other words, do at least one database operation such as a query on one of your entity sets before you start generating transient errors. The Entity Framework executes several queries during database initialization, and they aren't executed in a transaction, so errors during initialization could cause the context to get into an inconsistent state. Press F5 to run the application in debug mode, and then click the Students tab. Notice that you can see the actual SQL queries sent to the database. You see some initial queries and commands that Entity Framework does to get started, checking the database version and migration history table (you'll learn about migrations in the next tutorial). And you see a query for paging, to find out how many students there are, and finally you see the query that gets the student data. In the Students page, enter "Throw" as the search string, and click Search. You'll notice that the browser seems to hang for several seconds while Entity Framework is retrying the query several times. The first retry happens very quickly, then the wait before increases before each additional retry. This process of waiting longer before each retry is called exponential backoff. When the page displays, showing students who have "an" in their names, look at the output window, and you'll see that the same query was attempted five times, the first four times returning transient exceptions. For each transient error you'll see the log that you write when generating the transient error in the SchoolInterceptorTransientErrors class ("Returning transient error for command...") and you'll see the log written when SchoolInterceptorLogging gets the exception. You're not logging the value of the parameters, but you could do that. If you want to see the parameter values, you can write logging code to get parameter values from the Parameters property of the DbCommand object that you get in the interceptor methods. Note that you can't repeat this test unless you stop the application and restart it. If you wanted to be able to test connection resiliency multiple times in a single run of the application, you could write code to reset the error counter in SchoolInterceptorTransientErrors. To see the difference the execution strategy (retry policy) makes, comment out the SetExecutionStrategy line in SchoolConfiguration.cs, run the Students page in debug mode again, and search for "Throw" again. Uncomment the SetExecutionStrategy line in SchoolConfiguration.cs. Advance to the next article to learn about Code First migrations and Azure deployment.